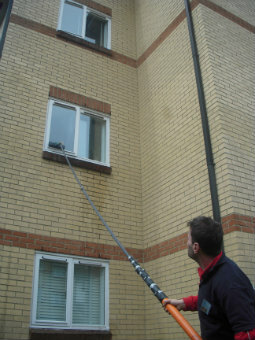 Wash your windows with a new cleaning approach that has met the requirements of over 94% of our customers in Kensal Town! A: We can promptly remove smudges with either outer window cleaning (for four-storey properties), rope access window cleaning (for tall properties), or via the well-known manual cleaning of interior casements. A: Certainly! This equipment can extend up to 22 metres in length, allowing the team to effortlessly reach and clean even the remotest corners of your glass surfaces. Q: Why don't you shine the windows with your water-fed pole? A: Our water is filtered from any residue-causing minerals. When this fluid evaporates under the sun, it won't leave any streaks behind. A: Rainwater is usually unpolluted, so it won't halt us from doing our responsibilities. However, while we won't be bothered by a slight sprinkle, a sudden downpour can bring unsatisfying results. During thunderstorms, we may have to postpone our service for a day of your convenience to ensure the team's safety. Q: Do I need to wait in my property until the service is done? A: No, the seasoned window cleaners in Kensal Town can easily perform outer window cleaning while you are away, as long as your property gates are unlatched. And if you want your casements to glitter on the inside, just book our free of charge key pick-up and delivery option instead. With the intuitive water-fed pole equipment, the experts can help you outshine your competition at fair fees. And you can lower our window cleaning Kensal Town rates even further by merging two or more of our cleaning services together! To find out the exact amount behind our price offers, make sure to stop by our handy price table below. With window cleaning in Kensal Town, you can efficiently remove long-forgotten splodges from any industrial or household property. Read on to learn how. To clean your windows' exterior side, the practiced window cleaners in Kensal Town will deploy a modern cleaning equipment – a water-fed pole that runs on distilled water. The cleaning tool's notable reach (22 metres) allows the technicians to drive out dirty spots from any four-storey premises without using ladders or harmful cleaning products. To remove stains on multistorey properties, we've designed a wholly different cleaning procedure – the rope access window washing. After evaluating your property's size and placement, a team of reliable climbers will either use ropes or ladders and squeegees to reinstate the former glory of your casements. We always outline each session beforehand to avoid incidents and can offer you all the necessary COSHH reports upon request. To refresh windows in-house, the team may have to carry squeegees and ladders to reach higher places. In our aim to help as many Londoners as we can, we've widened our window cleaning in Kensal Town to encompass extra regions across the capital. For your convenience, we've included the names of these nearby locations below. Alternatively, get a free instant quote or order affordable window cleaning services Kensal Town W10 online, through our web site.